FACEBOOK users now write on their friends' Timeline, but writing on the wall is still greatly encouraged. 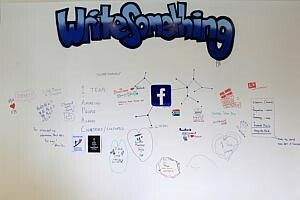 At its office on Cecil Street, there is a wall with the Facebook logo and the words "write something" on it. Staff have left their scribbles and drawings on it, and visitors too, are encouraged to write something. A certain minister who visited the office did that too. Vikram Kumar, who is in charge of real estate and facilities management for its Asia Pacific office, says that all the Facebook offices around the world have such a wall. The other Facebook offices are located at its headquarters at Menlo Park, California and in cities such as London, Paris, Sao Paolo and Tokyo. The social networking site moved into its office in July last year, and has since expanded, taking up another floor in an office building about two months ago. Mr Kumar says that "the Singapore office has a similar feel to the other offices, but with a local touch". For a start, it is hard to miss the graffiti of fantasy creatures, koi fish and flowers on the wall. These were done by local professional artists, "to reflect local street art", says Mr Kumar. At its microkitchen which is stocked with snacks and cup noodles, there are the familiar kopitiam chairs but given fresh coats of paint in bright yellow, orange and reds. Metal shutters, the same ones seen on old provision shops, line one side of the microkitchen. There is a mural of old Singapore on a wall and another has a mural of modern day Singapore. The vibe here in the office is one that is fun. There are terraces on the upper floor with mist fans, lounge chairs and even a hammock on it. These areas are popular with staff in the evenings. On one of the terraces is a vertical green wall. Upclose it looks as if there are just random plants growing on it, but step back, and the eye sees an "f". The lower floor houses the staff work area and meeting rooms. An industrial-looking staircase connects the two floors. Meeting rooms have fun names, given by the staff such as "You had me at Hello Kitty" and "I'm a Seoul Man". Some of the smaller meeting rooms resemble cosy living rooms, with the vintage armchairs, plush carpets and colourful wallpaper. Despite their homely appearance, these rooms come equipped with teleconferencing equipment, just like the bigger meeting rooms. The work area adopts an open concept, and staff are free to play their own music. Mr Vikram says that the company believes in being proactive when it comes to giving staff a comfortable environment to work in. This includes providing ergonomic work chairs and height-adjustable tables. The fun element extends to the choice of furnishings, such as ceiling lights fashioned out of chicken wire wrapped around light bulbs and tables and benches made of plumbing pipes. There is a lounge area on this floor, and another pantry that is stocked with snacks. A fridge by the side stocks water and beer. Mr Vikram says it was important to create a home away from home feel, as staff spend many hours at the office. Facebook's head of Asia Pacific region Erik Johnson says that people are the company's most important asset. "By making the office a great and fun place to work, people will like spending time here and want to contribute more."